After foster-parenting four young siblings a decade ago, Summer Wood tried to imagine a place where kids who are left alone or taken from their families would find the love and the family they deserve. For her, fiction was the tool to realize that world, and Wrecker, the central character in her second novel, is the abandoned child for whom life turns around in most unexpected ways. It's June of 1965 when Wrecker enters the world. The war is raging in Vietnam, San Francisco is tripping toward flower power, and Lisa Fay, Wrecker's birth mother, is knocked nearly sideways by life as a single parent in a city she can barely manage to navigate on her own. 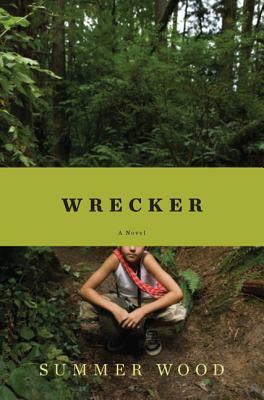 Three years later, she's in prison, and Wrecker is left to bounce around in the system before he's shipped off to live with distant relatives in the wilds of Humboldt County, California. When he arrives he's scared and angry, exploding at the least thing, and quick to flee. Wrecker is the story of this boy and the motley group of isolated eccentrics who come together to raise him and become a family along the way. For readers taken with the special boy at the center of The Story of Edgar Sawtelle, Wrecker will be a welcome companion. Summer Wood is the author of Arroyo. In 2007 she was awarded the Literary Gift of Freedom from A Room of Her Own Foundation for her work on Wrecker. She teaches writing for the University of New Mexico's Taos Summer Writer's Conference and in 2009 directed the first annual NEA/Taos Big Read. She is currently the director of the Young Writers' Mentorship Program and has lived in Taos for the past 20 years. Compare the three settings of Wrecker: hippie San Francisco, the women’s prison at Chino, and the secluded Mattole Valley. How does each of these settings look and feel in the novel? What does Lisa Fay miss most about San Francisco? Why does the Mattole Valley feel like home to Melody? Discuss the circumstances of Meg’s illness. What was Meg like before she got sick? What toll does Meg’s condition take upon her marriage, and how does Len express his devotion and his doubts? What are Len’s first impressions of three-year-old Wrecker? What reservations does Len have about taking Wrecker in? Are his worst fears justified? Why or why not? Each resident of Bow Farm—Melody, Willow, Ruth, Johnny Appleseed, and Wrecker—has survived a difficult past. How do we learn about their histories? What are they running away from, and how do they reconcile a painful past with a hopeful present? Young Wrecker’s early days at Bow Farm are full of “love in overalls, love with a spade in its hand.” (28) Why is taking care of Wrecker such hard work? What does each of his caretakers contribute, and how do they make this unusual family work? Compare Melody and Willow, the two founders of Bow Farm. How do their personalities, homes, and parenting styles differ? What are the sources of tension between these two friends, and how do they eventually resolve their differences? Lisa Fay puts off naming her son until he says to her, “I a wrecker.” (63) What is the meaning of this unusual name? What are some of Wrecker’s destructive tendencies, and how does he fight the urge to “wreck” the things and people around him? Love doesn’t come easily in this novel: Arlyn leaves Lisa Fay, Melody and DF Al don’t stay together, Len misses the old Meg, and Ruth mourns the death of Elizabeth. What does this theme of difficult romance add to the novel? How do these stories of lost love compare to Len and Willow’s romance? Trace the journey of the photo that Belle snapped on Wrecker’s third birthday. How does the photo get passed along, and what does it mean to each person who has it? How does it eventually land in Wrecker’s hands? Consider Lisa Fay’s fifteen years in prison. How does she cope with her circumstances, and what memories and emotions threaten her sanity during these long years? When Melody tells Wrecker about his mother, she finally understands that “her omission could be as gravely harmful as an outright lie.” (239) Why does Melody keep Wrecker’s history from him for so long? What are the consequences of her silence? Was her “omission” a mistake? Why or why not? While Wrecker is at his first school dance, Len and Willow finally admit their feelings for each other. Discuss how these two scenes fit together: Wrecker meeting girls and Len and Willow getting closer in a bar. What discoveries do these characters make during this trip to town? Why does Willow share her own story as a mother in her good-bye letter to Wrecker? Discuss how Willow’s family history leads her to give Wrecker the following advice: “Listen to me. Don’t choose. Melody is your mother. Lisa Fay is your mother, too.” (259). How does Wrecker respond to Willow’s advice? Wrecker spans twenty years, from the boy’s birth to his young adulthood. When does time seem to pass slowly in the novel? When does it pass quickly? Which important events mark these years of Wrecker’s life? How does Bow Farm and the Mattole Valley change over these two decades? Discuss the last scene of the novel, when Wrecker, Ruth, Len, Willow, Melody, and Lisa Fay sit down to dinner together at Bow Farm. How does this dinner make them into a family? Why do you think it is told from Ruth’s perspective? How would this scene be different from the point of view of another character?